I wrote yesterday about the continuing success of Switzerland’s spending cap. Before voters changed the Swiss constitution, overall expenditures were growing by an average of 4.6 percent annually. Ever since the “debt brake” took effect, though, government spending has increased by an average of just 2.1 percent. For all intents and purposes, Switzerland is getting good results because it is now complying with fiscal policy’s Golden Rule. Unfortunately, the same cannot be said for the United States. The Congressional Budget Office just released its new long-run forecast of the federal budget. The most worrisome factoid in the report is that the overall burden of federal spending is going to expand significantly over the next three decades, jumping from 20.6 percent of the economy this year to 29.3 percent of economic output in 2048. And why will the federal budget consume an ever-larger share of economic output? The chart tells you everything you need to know. Our fiscal situation is deteriorating because government is growing faster than the private sector. Actually, the chart doesn’t tell you everything you need to know. It doesn’t tell us, for instances, that tax increases simply make a bad situation worse since politicians then have an excuse to avoid much-need reforms. And the chart also doesn’t reveal that entitlement programs are the main cause of ever-expanding government. 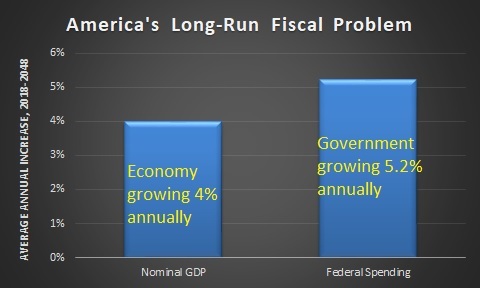 But the chart does a great job of showing that our fundamental problem is growth of government. Which presumably makes it obvious that the only logical solution is a spending cap. The good news is that there already is a spending cap in Washington. But the bad news is that it only applies to “appropriations,” which are a small share of the overall federal budget. And the worse news is that politicians voted to bust that spending cap in 2013, 2015, and earlier this year. The bottom line is that we know spending restraint works, but the challenge is figuring out a system that actually ties the hands of politicians. Switzerland and Hong Kong solved that problem by making their spending caps part of their national constitutions. Sadly, there’s little immediate hope of that kind of reform in the United States. You are right Zorba, but in this case those are nominal rates. Probably because the future govt spending was stated in nominal terms, so to make it apples-to-apples consistent, Dan also made the GDP growth nominal. Oh I see, you meant the graph in Dr. Mitchell’s post. Yes, I believe that is nominal GDP. I thought you meant the roughly four percent average world growth rate. I think that most of the time economic growth figures are stated as “Real Economic Growth”, which adjusts for inflation. Were that not the case Venezuela would boast growth rates of over one hundred percent. Neither have I ever heard of the US having a growth rate of over ten percent in the late seventies. I’m sorry you don’t place much hope in a Convention of States. That 4% growth is nominal GDP. If you back out inflation, it’s only real growth of 1.5% to 2.0%. That is not optimistic. The problem is the real growth of govt spending at 2.7% to 3.2%. Illegals are no more than four percent of the population. …which means that there are at least 46% fully American born and raised or naturalized useful idiots. A harbinger of the Armageddon awaiting the US is in full display here in Silicon Valley: The smartest, richest, and most competent Americans keep voting for ever bigger government! What else could be a bigger harbinger of the trouble ahead? Even supporters of smaller government in America draw their support not from utilitarian prosperity arguments but from some old fashioned conservative attachment to American traditions. It is only a matter of time before the “enlightened” competents of Silicon Valley do them in. The four percent long term growth rate for the US seems rather optimistic. The Bush-Obama era may be gone but the government growth programs they spawned are still alive and growing. Growing so much that (almost unnoticed!) Trump approved another gargantuan increase in the federal budget! And with government growing to the aforementioned size a sustained average four percent growth becomes an illusion. The growth of government itself will decrease long term growth trendlines. A vicious cycle unfolds — the typical suicide of a democracy. The more the US loses its economic standing in the world — a deterministic certainty since US growth rate is now structurally inferior to the average world growth rate — the more desperate American voter lemmings will vote themselves goodies from the common pot of government. The vicious cycle closes. Either shrink government and move up to a five percent growth rate, or shrivel up and decline as a faster growing world swallows up your economy. There is no other mathematically viable option. Any idea on a trendline indicating which option Americans are taking and will take? Exactly — hence stay mobile!